I'm struggling to figure out how to start this book review. I have been sitting here looking at this picture for awhile trying to figure out how to get this ball rolling...and I keep coming up blank! I guess it's best to just dive in with both feet forward and all the gusto I can muster. 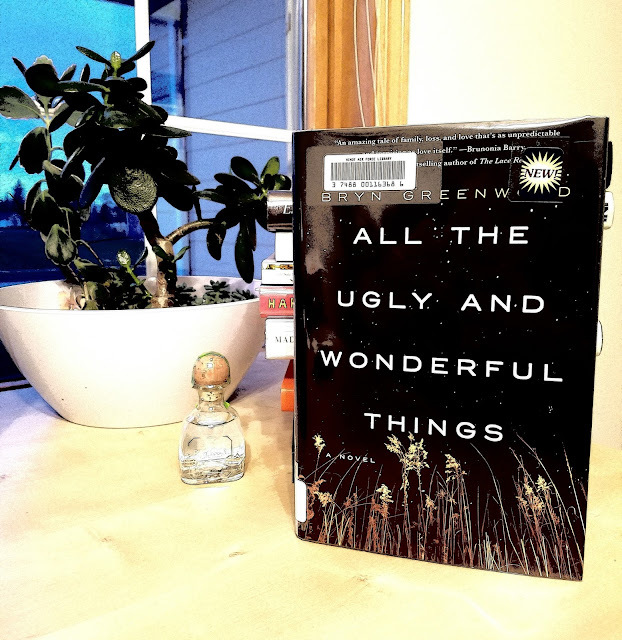 All the Ugly and Wonderful Things, a novel by Bryn Greenwood, is a very controversial book...and most of the reviews over on Goodreads vacillate between 1's and 5's, so it has garnered some much warranted attention and very strong emotions from it's readers. I'm leaning towards the five star review. The book tells the story of Wavy...short for Wavonna, the child of a meth dealer and a drug addict. We begin with her as a very young child, about 5, and the viewpoint of her grandma...then her aunt...then her cousin. Her mother is in jail, so she goes to stay with family. All are describing this disturbed and odd little girl who doesn't speak, won't eat, won't let anyone touch her and sneaks out of the house in the middle of the night. They initially believe she is mentally challenged, until she wows Grandma with a pen and paper. When mom gets out of jail and comes to get her, with a new baby in tow...we finally get to the viewpoint of Wavy. It turns out there's a reason she doesn't speak. Her mother has taught her that her mouth is dirty. She has taught her not to speak to anyone, least of all her father Liam. The reason she doesn't eat is her mother has taught her food has germs, her mouth has germs, food is threatening. She doesn't want anyone to touch her...she is dirty, infected and gross...and doesn't trust anyone. So she sneaks bits of food out of the trash can, and eats when no one is looking...just enough to sustain her fragile and delicate body. She sneaks out at night to steal food...and to look at the stars. She knows the names of all the constellations and loves to watch them anytime she can. Her living conditions are deplorable...and she is raising her baby brother the best she can, while her mother is in bed drugged to the hilt, or raving mad manic and obsessive and her father is down at "The Ranch" cooking meth and sleeping with his live-in girlfriends. She knows how to cook her grandma's recipes, if she can get anyone to bring her food. And she scrubs and cleans the best she can. 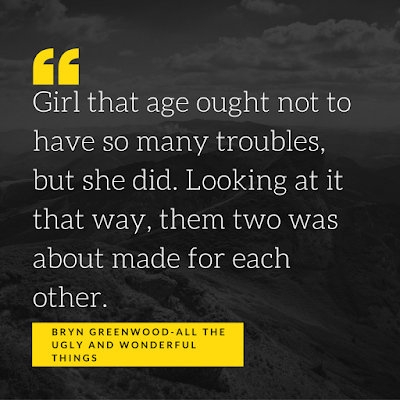 One night, at the age of 8, she is out in the meadow surrounding her house looking at stars when she hears a motorcycle coming up the drive. She goes to see who is coming, and inadvertently makes the giant figure wreck his bike. There is something about him that is different than everyone else. So she talks to him, touches him, and helps him get help for his injuries. He is so taken by this angelic girl that once he is healed he returns to the house of his "boss" to tell the child thank you for saving him. His arrival coincides with her first day of school, and he accidentally makes her miss the bus so he gives her a ride on the back of his motorcycle. This book is so well written that in the midst of being shocked and outraged by what is going on, you can also see that in a way Kellen and Wavy are good for each other. As a mother, I would never in a million years condone this relationship. I think you could safely say I am very much anti-pedophilia...trust me. It is horribly inappropriate, and at times this book goes to graphic places that are incredibly hard to read. But it never felt exploitative to me. It didn't feel like it was being written for shock value. It just felt sad...and very real. The author does such an incredible job of creating depth in these characters, and you are privy to so much of their internal dialogue, that the relationship between Wavy and Kellen almost makes sense. Almost. I just couldn't put the book down. It felt similar to Sharp Objects in a way. The subject matter is horrifying really, but it's written so well that you are left wanting more...so you just keep flipping pages until it's done. 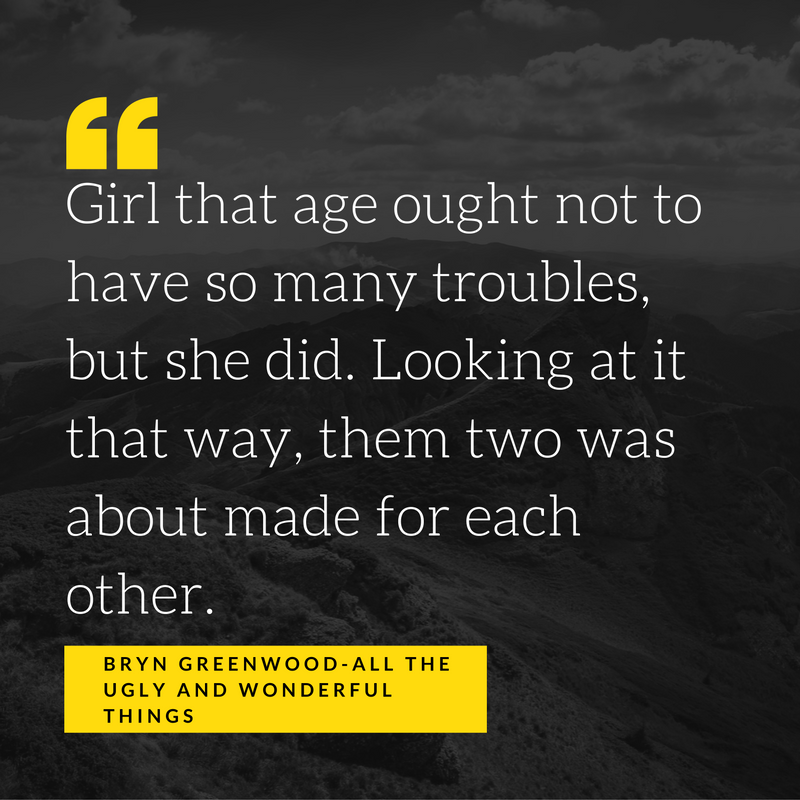 I would definitely pick up Bryn Greenwood's next novel, regardless of the subject because she is good at what she does. I almost feel guilty for liking it so much! I'm torn in a way on whether or not it would be a good book club selection. I think that some people just aren't going to be able to stomach it. They won't be able to get past the premise, and it's definitely not an easy read. But there are oodles of good conversation topics so...if you can get past the outrage the discussion would be bountiful. The author states she is "the daughter of a mostly reformed drug dealer" so I'm curious how much of the book she took from real life experiences, even if it's just a tattoo she once saw or a peculiar trait she put into a character.